Responding to Iashea Cross’s cry, “Are you ready to take action?,” on August 31 members of Chicago ADAPT and the Alliance for Community Services, and personal assistants from SEIU Healthcare Illinois, kicked off Labor Day weekend by blocking two streets at the State of Illinois Building in downtown Chicago. Cross serves as personal assistant to her sister, who lives with a chronic medical condition. 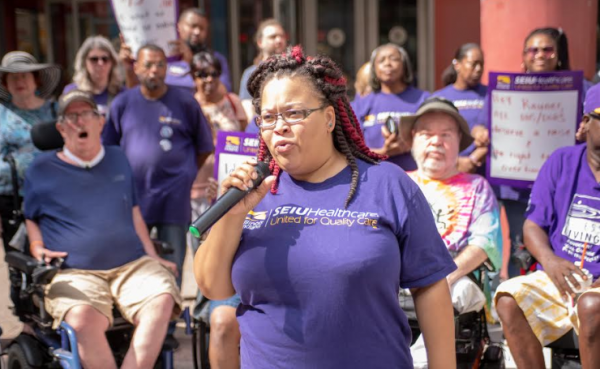 Her family is struggling with financial difficulties created by Governor Bruce Rauner’s punitive policies toward people with disabilities and the workers who provide them with home- and community based long term care services. Demonstrators held the intersection, disrupting early holiday traffic, for 20 minutes, and ended the action just before the police began to make arrests. 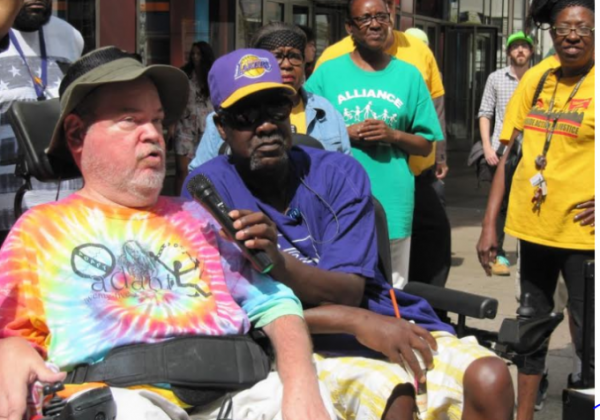 As Chicago ADAPT member Mike Ervin explained, Rauner has refused to implement a pay raise, approved last year by the Illinois General Assembly, for personal assistants; and is pursuing an overtime policy for personal assistants that leaves people with disabilities with inadequate hours of care and the workers with poverty level wages. People with disabilities want to live in and contribute to their communities. Home care workers support their families by making possible the fulfillment of these aspirations. Home- and community-based services save money as compared to institutionalization in nursing homes. Illinois is struggling with a budget crisis. Governor Rauner’s policies make neither social nor economic sense. 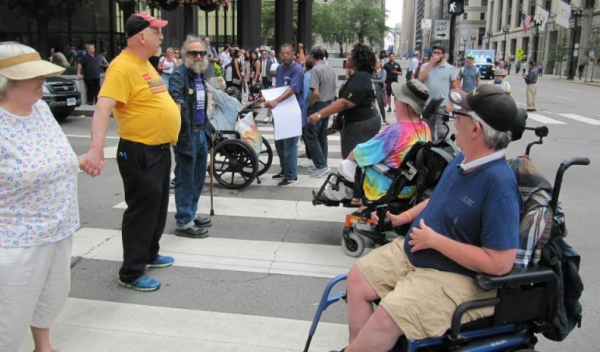 Members of Chicago ADAPT, SEIU, and the Alliance for Community Services will continue to fight them.